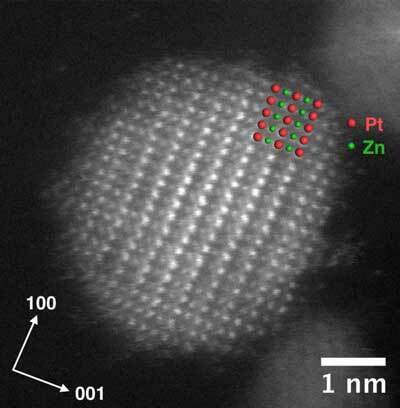 (Nanowerk News) Scientists at Ames Laboratory have discovered a method for making smaller, more efficient intermetallic nanoparticles for fuel cell applications, and which also use less of the expensive precious metal platinum (JACS, "Sub-4 nm PtZn Intermetallic Nanoparticles for Enhanced Mass and Specific Activities in Catalytic Electrooxidation Reaction"). The researchers succeeded by overcoming some of the technical challenges presented in the fabrication of the platinum-zinc nanoparticles with an ordered lattice structure, which function best at the small sizes in which the chemically reactive surface area is highest in proportion to the particle volume. "That surface-to-volume ratio is important in getting the most out of an intermetallic nanoparticle," said Wenyu Huang, Ames Laboratory scientist and assistant professor of Chemistry at Iowa State University. "The smaller the particle, the more surface there is, and more surface area increases the catalytic activity." But the high temperature of the annealing process necessary to form intermetallic nanoparticles often defeats the goal of achieving a small size. "High-temperature annealing can cause the particles to aggregate or clump, and produces larger sizes of particles that have less available surface and aren't as reactive. So, just the steps necessary to produce them can defeat their ultimate chemical performance," said Huang. To prevent aggregation from occurring during the heating process, Huang's research group first used carbon nanotubes as a support for the PtZn nanoparticles, and then coated them with a sacrificial mesoporous silica shell for the high-temperature annealing to form the intermetallic structures. A chemical etching process then removes the silica shell afterward. The resulting final product of uniform 3.2 nm platinum-zinc particles not only yielded twice the catalytic activity per surface site, that surface area saw ten times the catalytic activity of larger particles containing the same amount of platinum. The discovery was made possible in part by the capabilities of a new Titan scanning electron microscope at Ames Laboratory's Sensitive Instrument Facility, jointly funded by the Department of Energy and Iowa State University. "Being able to see the distributions of the material at atomic level with our new microscope has made an enormous positive impact on the Laboratory's capabilities to fine-tune materials," said Lin Zhou, associate scientist and instrument lead for the Sensitive Instrument Facility. "It's a much more immediate process, being able to collaborate directly with the fabrication scientists in-house. Based on the results and suggestions we provide, they can improve the material, we can characterize it yet again, and the discovery cycle is much faster."